The fast-depleting reserves of conventional energy sources and ever-changing environmental impacts have resulted in an urgent need for high-efficiency renewable energy sources and energy-saving materials. His research primarily aims to selectively control thermal radiation for energy applications by fundamentally understanding and exploring novel physical mechanisms in nanoscale radiative transport with nano-engineered materials or so-called metamaterials. “One of my main focuses — and that of my team of graduate and undergraduate students — is on enhancing solar energy harvesting and conversion, like solar to heat by minimizing thermal radiation, which causes energy loss,” Wang said. The goal, he said, is to design materials that are nearly 100 percent efficient in their absorption of the right spectrum of sunlight with close-to-zero emissivity in the infrared. Thermal loss, he explained, happens at the longer wavelengths so the goal is to achieve “spectral selectivity” with nano-engineered materials. Wang and his students are developing materials that will perform at higher temperatures, up to 700 degrees Celsius (1,292 degrees Fahrenheit), at which more power can be potentially produced. 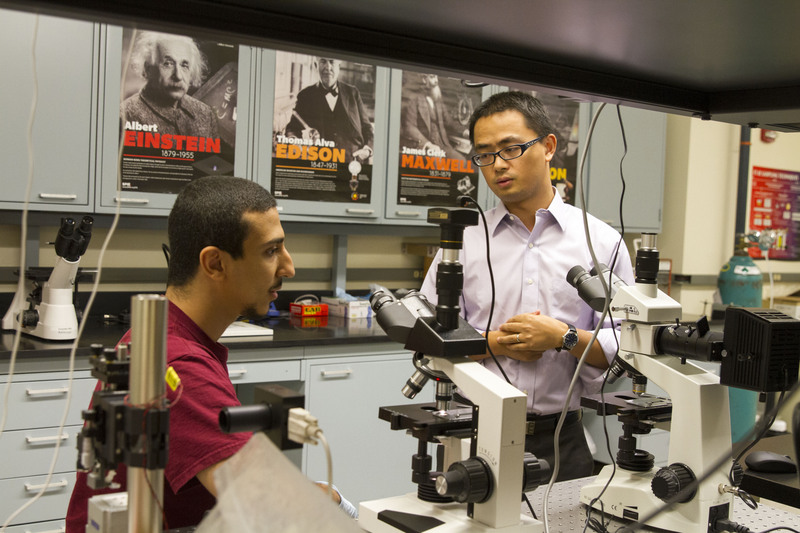 Wang, who has published more than 20 papers in peer-reviewed journals over the past three years at ASU, was this year granted a prestigious National Science Foundation Faculty Early Career Development Program (CAREER) award to advance his research, and that of his students. The award is being used to engineer new materials with micro/nanoscale feature sizes comparable to or smaller than the wavelength of light. Wang’s lab is employing physics to improve the conversion efficiency of solar thermal, solar photovoltaic and solar thermophotovoltaic energy-harvesting applications. “We are investigating the resonance behaviors that a nano-engineered material exhibits in response to external electromagnetic waves at visible, near-infrared and mid-infrared ranges for tailoring thermal radiation at will,” Wang said. Wang said what makes his lab distinct is that they can take their concepts all the way through the engineering process — they design and fabricate the materials, as well as develop the state-of-the-art instrumentation to characterize material properties, and thus optimize performance. He said that although proving the science is important, it is also important to lower the cost of production if the materials are ever going to get to market. Wang’s CAREER program will lead to a wide range of civil, military, aerospace and industrial applications. The success of this project will ultimately result in wide applications of energy harvesting to convert solar energy to heat and power, as well as energy savings by radiative cooling or heating using "smart" coating materials. Smart coatings, he explained, could be laminated on building roofs or embedded in exterior material and would ideally radiate heat to cool in the summer or absorb more to heat the building in winter. “A smart coating could even be used to create clothing that would help heat or cool the human body for maintaining personal comfort and health in different environments,” he said. Wang joined the ASU faculty in 2012. He received his doctoral degree in mechanical engineering with a focus on nanoscale radiative heat transfer from Georgia Institute of Technology. Wang is the lead principal investigator for ASU’s participation in the U.S.-Australia Solar Energy Collaboration on Micro Urban Solar Integrated Concentrator project, sponsored by Australian Renewable Energy Agency. Teams of researchers in the American Southwest (including a group from Arizona State University) and North Atlantic islands have found that historic and prehistoric peoples in these regions who had created vulnerabilities to food shortfall were especially susceptible to impacts from climate challenges. Their “natural” disasters were human-made in conjunction with climate challenges, the researchers found. The researchers discovered that social factors, such as limitations on networks and mobility, were the primary contributors to vulnerability to food shortage. The research teams were composed of archaeologists at Arizona State University and historians, archaeologists and geographers working in the subarctic islands of Iceland, Greenland and the Faroes. Their findings appear in the early online edition of the Proceedings of the National Academy of Sciences. “We were drawn to this collaboration because in spite of the different environments, cultures, histories, climates and identities of the two regions, we were asking the same kinds of questions about human capacities to address challenging climate conditions,” says lead author Margaret Nelson, President’s Professor in ASU’s School of Human Evolution and Social Change. Nelson also is vice dean of Barrett, The Honors College at ASU. Understanding human capacities to address climate challenges is as important today as it was in the past. “Our ability to combine our knowledge has led to understandings of this issue that transcends a single region, climate type, people or tradition,” Nelson said. Nelson stresses that not only does the work identify the role of the past in informing the present but also the importance of exploring diverse conditions for understanding how to meet current challenges related to climate-induced disasters. Her research makes a case for addressing vulnerabilities as part of effective disaster management. The School of Human Evolution and Social Change is a unit of ASU's College of Liberal Arts and Sciences.